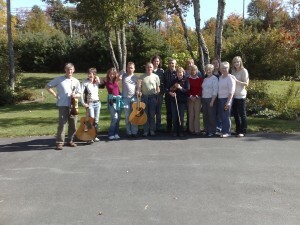 Sixteen Taransay fiddlers have just returned from Nova Scotia and Cape Breton where they played their music in nearly every corner of the island. After a short stay in Iceland where all the fiddlers swam in the Blue Lagoon geothermal waters it was on to Halifax. A visit to Pier 21 in Halifax where 1.5 million immigrants, war brides, displaced people, evacuee children and Canadian military personnel passed through between 1928 and 1971 was enjoyed on a lovely sunny day. The fiddlers then picked up three 30 foot Winnibagoes for onward travel to Peggys Cove where the fiddlers played in the local Sou` Wester restaurant to great applause.Peggys Cove is situated on the south shore of Nova Scotia. The local fish chowder was enjoyed by all. It was then northwards to Hammonds Plains where the fiddlers were entertained by local couple Leila and Chris Gashus who also fed the group for the long onward journey.As Liela was originally from Glasgow she enjoyed hearing the fiddlers.Next stop was Antigonish a cultural centre of Atlantic Canada.As it was Thanksgiving Sunday some of the fiddlers actually made it to church on Sunday morning. After a day in Antigonish it was northwards for Cape Breton and the Ceilidh Trail.At last they crossed the causeway and before long were in Judique the home of Buddy Macmaster.Cape Breton Island is now joined to the mainland by the Canso Causeway, completed in 1955,The fiddlers performed twice in the Celtic Music Interpretive Centre,Judique.A Cape Breton legend Kinnon Beaton also played in the afternoon.Buddy Macmaster sadly could not perform as he was unwell.This was a shame as his home is actually next door to the centre.At the concert in the evening the stars of the show were our very own Shonnie Beag and Calum Alex Macmillan. Next stop was Little Judique where a fry of fresh mackerel and some local crowdie was aquired and subsequently devoured in no time. Mabou next and the famous Red Shoe where local musicians played.The Red Shoe has become famous for its entertainment and is now owned by The Rankin Family. Its then through Inverness and Cheticamp and on wards to the Cabot Trail ,a two hundred mile drive and one of the most beautiful scenic drives in the world. Named for famous explorer John Cabot, the Cabot Trail winds around the rocky splendour of Cape Breton’s northern shore, ascending to the incredible plateaus of Cape Breton Highlands National Park. This magnificent highway is carved into the sides of mountains that rise high above the shimmering waters of the Gulf of St. Lawrence. Lookoffs offer unforgettable vistas of Cape Breton’s rugged coastline, where pods of whales can often be seen just offshore and bald eagles soar aloft . Offshore are the Magellan Islands and the Gulf of St Lawrence.Dingwall is the next stop for two days. Virgin forest of 300 year old sugar maples with wonderfull colours are in abundance.The scenery is spectacular. The concert in the evening has Cape Breton legends Brenda Stubberts and Howie Macdonald playing along with Bryan Gear and Violet Tulloch(Shetland)with Angus Grant Sen.from Fort William. Friday and the rains came and it is southwards to St Annes where Mairi Smith(Ness) seemed shocked to find so many from Lewis walking towards her.Baddeck is next where the fiddlers perform in the Yellow Cello and then a concert to watch Beolach a talented young Cape Breton band.The fiddlers again perform at the Inverary resort in Baddeck. The fiddlers settle on Saturday night at Whycocomagh.It is located on the eastern edge of Inverness County in the central part of Cape Breton Island. The community sits on the northwestern shore of St. Patrick’s Channel, an arm of Bras d’Or Lake. Whycocomagh is a Mi’kmaq word which means ‘Head of the Waters’. The community is bisected by the Skye River. Southwards again and back to Peggys Cove and finally to Halifax for the flight home. A most enjoyable and very busy trip especially for our younger fiddlers who received an insight into Cape Breton and Scottish fiddle music from a Canadian perspective.The Taransay Fiddlers would like to thank all those who assisted in the organisation of the trip and those that helped us in any way.